Now the server will be developed with some error handling, proper logging, an IoC and an Client assembly with an interface and DTOs. To make it easier to use in a .NET client project, we can create an assembly which will be shared with all Hub clients. This assembly should contain all DTOs and interfaces for using the Hub. We define 2 interfaces, one for receiving messages and one for sending messages. These 2 interfaces are not required by the client, but it makes it easy to implement a client for the Hub. We can also add HubPipelineModule(s) to our Hub. 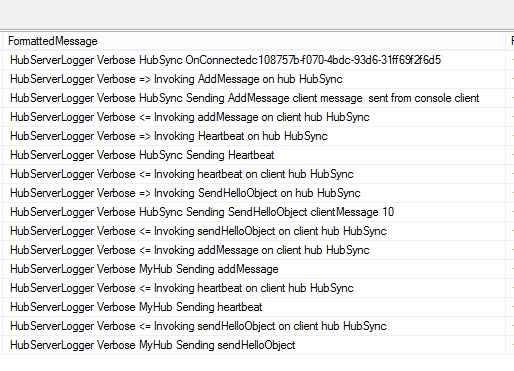 On the server, only the ISendHubSync interface needs to be implemented as the Hub itself can be used to receive messages. In this server, SLAB OUT-OF-Process is used to log everything. With very little effort, a stable signalR Host can be created in a console or Windows service application (or IIS). >In this server, SLAB OUT-OF-Process is used to log everything. i run the solution but i dose not see this logs.why? EventSource.IsEnabled() always return false. I’ll have a look at this in the holidays, the SLAB OUT-OF-PROCESS logging should work, I run it locally to see what is required.